Celtic step dancing was a major part of the production. The Old Testament prophet Jeremiah often was scorned for delivering God's message, but many people believed and followed him. Jeremiah talks to God during one of his many struggles to deliver the Lord's Word. The production featured lavish colors and sets as evidenced by this scene. “Awesome,” “brilliant,” and “inspiring,” commented crowds attending the encore production of “Jeremiah,” as they presented the players with a standing salute. 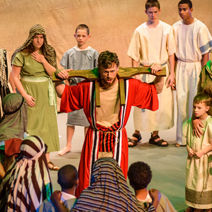 The lavish musical that excited them was about Jeremiah’s Biblical mission and journey and was embellished by perfected Celtic step dancing, choral narration and colorfully designed settings. A full orchestra emphasized the fine work of the outstanding music department at the college, especially the expertly-trained students of the Muggivan School of Irish Dancers, taught by Joni Muggivan, and recognized annually in national and international competitions. “Jeremiah” proved to be the perfect complement to the Armstrong International Cultural Foundation’s display of the timeline archeological exhibit with artifacts of “Seals of Jeremiah’s Captors Discovered” in the Armstrong Auditorium, merely steps away from the performance. The ingenious pairing of the display and the musical explains to the novice spiritually and logically the fundamental prophecy-based teaching of the Philadelphia Church of God and its leader, the late Herbert W. Armstrong. By cooperating with and sponsoring international scholar-led archeological digs in Jerusalem, Herbert W. Armstrong, for many years, as the exhibition suggests, sought to reconnect lost history with Biblical prophecy. By early 2001, Armstrong College students began taking part in the digs. The recent discoveries linked to the exhibition, as well as the musical, center around the recorded events of Jeremiah’s life and his journey to Ireland during the Babylonian captivity to deliver the remaining Hebrew princess of House of Dan, daughter of King David, along with the books of the Torah and several other holy items, to safety. The time period was about 569 B.C. The musical ties in Tara Hill in Ireland and a mysterious religious leader and his retinue who arrived from the East at that date; hence the Celtic dance and continuing spirituality. The entire musical of “Jeremiah” was presented in five scenes of two acts, lasted about two hours, and featured 24 lead singers, 17 lead dancers and a corps of 21, plus an adult chorus of 18 and youth chorus of 28, accompanied by the 12-piece orchestra — quite a masterful undertaking. With soaring music by Ryan Malone, expressive lyrics by David Brandon and charming choreography by Paris Turgeon and Amy Flurry, not only were all the Armstrong Imperial Academy students entirely involved, but the faculty and staff as well. Although “Jeremiah – The Musical” will be difficult to re-stage on such a grand scale, it surely will have a rich future, not only because of its lovely score and other stellar features, but also because of its graphic relevance to Biblical prophecy, which is far too important to be out of the spotlight for long. The important archeological display will continue. Admission is free to the public.